Would you like to help enhance land conservation within the Lookout Mountain region? Perhaps you are interested in supporting our Youth Partnerships focused on leadership, academic success, teamwork and job skills training. Or, assisting our staff and volunteers in trail management and implementation. Or, working to restore or conserve your own family lands? Let's explore how we can work together to further our collective goals. As a small community-based nonprofit, we depend on our community's support and investment. With you, we can meet the needs of our youth, work with local families to realize their conservation dreams, and continue to protect the important wildlife habitat and scenic trails along Lookout Mountain. All year long, local community organizations are critical to supporting our partnerships. Volunteers from the Chattanooga Police Department, the Rotaracts and Rotary Club, the Garden Club of Lookout Mountain, and YouthWorks have leant their muscle and energy to building trails, removing invasive plants and restoring the natural areas on Lookout Mountain. You can be a part of that too. Whether you have a couple of hours or an entire day, working with us on the Mountain makes a difference. If you prefer working inside, we periodically have mentoring opportunities for students who need help with their academic work. Mentoring will be coordinated with the Howard School Intern and Leadership Program. Mentors are required to complete an application process and will be screened prior to any assigned role. We are very careful to ensure the safety of our youth and our volunteers. Lookout Mountain Conservancy interns and volunteers are occasionally asked to lend their expertise and muscle to workdays with area land trusts and conservation organizations. Some of these projects include building a bird banding research station with the Tennessee River Gorge Trust, developing new bike trails with Covenant College and the National Park Service, and trail maintenance with the Friends of Chickamauga and Chattanooga National Military Park. 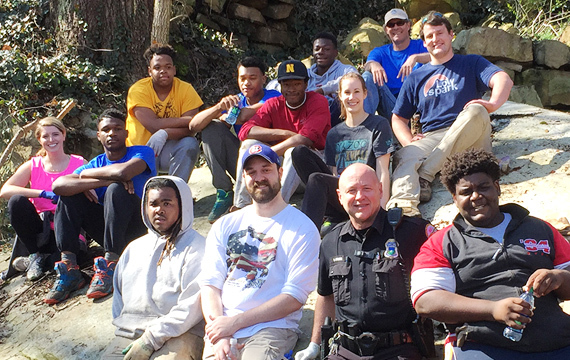 LMC Interns and volunteers from the Chattanooga Police Department and Rotaracts work together on the trails.